Shubert Alley is a narrow 300-foot (91 m) long pedestrian alley at the heart of the Broadway theater district of New York City. It splits a block, as it runs parallel to and between Eighth Avenue and Broadway, linking West 44th Street to West 45th Street. It contains approximately 6,400 square feet (590 m2) of public space. The alley has been considered the geographical center of Broadway theatre. Richard Hornby wrote in 1991 that: "In New York, the desirability of a theatre is inversely proportional to its distance from Shubert Alley." The alley was originally built as a fire exit between the Shubert Theatre (on 44th Street) and Booth Theatre (on 45th Street), and the Astor Hotel (bounded by Broadway, Astor Plaza, and West 44th and 45th Streets), as fire laws of the time required that there be room for fire equipment in the event of an emergency. The Astor Hotel, which had opened in 1904, was demolished in 1968, and its location is now occupied by the high-rise 50-story office tower, One Astor Plaza. The Shubert and Booth Theatres, which both opened in 1913, were owned by Lee and Jacob J. Shubert. The alley is called the Shubert Alley because the Shuberts, who were then New York's most powerful theater owners and producers, had their offices overlooking it and rented the alley. They leased it from the Astor estate in 1912, in a decades-long-lease. The Shuberts parked their cars in the alley, which was gated and locked at night. Actors would gather in the alley while waiting to try out for parts, lining up along the western wall. having the color of one of those street scenes from a tropical revue, churning with actors, Broadway reporters, chorus girls, and a soupcon of booking agents and costumers. A hurdy-gurdy grinds out tunes, and often a street band adds oom-pahs to the medley.... There is good-natured shoving about, hoots, and back-patting. Stars are hailed by first name. Bootleggers are there with their order books. Also racing touts, with hot tips. In the 1930s, a New Jersey bus line used a fenced-off section as a bus terminal. The remaining area was used as the exit area for the stage doors of the Shubert and Booth Theatres. Cast members lounged in the fresh air during their breaks. Large posters hanging on the fence called "three-sheets", because they were three times the size of the "one-sheet" lobby cards, were hung from the fence to advertise shows underway in nearby theatres. The posters were moved to the side walls of the alley when the fence was later removed. It was reported in 1939 that the actor Raymond Massey built a bowling alley in his London home, and called it "Shubert Alley". A play entitled Shubert Alley was written by Mel Dinelli in 1943. I got a shock when I found that Shubert Alley is now a smart lane of elegant small shops, instead of being the empty alley where there used to be only a couple of stage doors, parking space for producer Lee Shubert's elegant limousine, and a place where actors met to discuss which offices were casting a new show that day. In November 1959, a one-hour musical entitled Music from Shubert Alley was recorded in the alley, and broadcast on TV. In 1960, singer Mel Tormé came out with an album of show tunes entitled Mel Tormé Swings Shubert Alley, which was arranged by Marty Paich. On March 22, 2006, to mark the first anniversary of the official Broadway opening of the musical comedy Spamalot, the "World's Largest Coconut Orchestra", 1,789 people clapping together half coconut shells, performed in Shubert Alley. The claim was officially recognized by the Guinness Book of World Records. Moments after Faisal Shahzad's failed 2010 Times Square car bombing attempt, a surveillance video caught images of him walking through Shubert Alley. Today, it serves as a theatre fire exit, and can be busy with audience members during show-times and intermissions. One Shubert Alley, a souvenir shop, is located in a converted former dressing room of the Booth Theatre. A free annual concert called "Stars in the Alley" is held in Shubert Alley the week of the Tony Awards featuring performances and celebrity guest appearances from current Broadway shows, marking the official end of the Broadway season. Broadway Cares/Equity Fights AIDS has held an Annual Flea Market and Grand Auction in Shubert Alley each September since 1987, selling props, costumes, and autographed memorabilia to raise money. "Broadway Barks", a charity event founded by Bernadette Peters and Mary Tyler Moore in which Broadway and other celebrities present shelter animals for adoption, has taken place annually in the alley since 1999. ^ Collins, Max (2008). Strip for Murder. Penguin. p. 3. ISBN 9780425221396. ^ a b Kayden, Jerold (2000). Privately owned public space. Wiley. p. 133. ISBN 9780471362579. ^ Hirsch, Foster (1998). The boys from Syracuse. SIU Press. ISBN 9780809321568. ^ Hornby, Richard (1991). "Broadway Economics". The Hudson Review. 44 (3): 453–460. doi:10.2307/3851981. JSTOR 3851981. ^ a b Henderson, Mary (2004). The city and the theatre. Back Stage Books. p. 172. ISBN 9780823006373. ^ Pederson, Jay (1998). International directory of company histories. St James Press. ISBN 9781558623651. ^ Roadtripping USA (2nd ed.). St Martin's press. 2007. p. 124. ISBN 9780312361822. ^ a b c Kissel, Howard (2007). New York theater walks. Applause. p. 47. ISBN 9781557836137. ^ a b c d e f Botto, Louis; Viagas, Robert (2002). At this theatre. Applause. p. 79. ISBN 9781557835666. ^ Liebling, AJ (2008). The telephone booth Indian. Random House. p. 114. ISBN 9780307480668. ^ Bloom, Ken; Vlastnik, Frank (2004). Broadway musicals. Black Dog & Leventhal Publishers. p. 252. ISBN 9781579123901. ^ Dinelli, Mel (1943). Shubert alley: a play for women. Baker's. ^ "Spamalot cast sets coconut record". BBC News. April 23, 2007. ^ the CNN Wire Staff (May 2, 2010). "Day before bombing, Shahzad made a dry run in Manhattan, source says - CNN.com". Edition.cnn.com. Retrieved May 6, 2010. ^ Steinbicker, Earl (2002). Daytrips New York. Midpoint Trade Books. p. 59. ISBN 9780803820210. 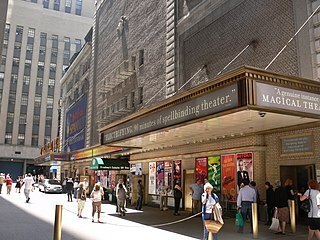 Wikimedia Commons has media related to Shubert Alley. This page was last edited on 8 March 2019, at 00:07 (UTC).